Messermeister provides the highest quality of cutlery and culinary tools to both food-service professionals and home cooks. They are committed to designing new and innovative products and sourcing the world to find the very best quality at the right price for the market. Their products are all fully warranted for the life of the user against defects in materials and workmanship. Messermeister is proud to have served the culinary community for over 28 years and will continue into the next generation. Royale Elite combines a beautiful California walnut burl handle to a fine German stainless steel alloy blade. Walnut burl features a rich deep brown flared pattern and is prized for its hard, strong characteristic as a handle material. The blade is one piece of hot dropped hammer forged German high carbon stainless steel that has been hand crafted into a fine cutting instrument. This vintage style knife is one of a kind and sure to become a treasured family heirloom. The entire blade of the Messermeister Royale Elite Stealth Chef's Knife has been ground down to a thin profile to create one sharp German chef's knife! The Elite Stealth Chef's Knife is the thinnest, sharpest Messermeister Chef's knife. The blade is shaped so that it can peel, trim, slice, dice, chop and mince vegetables, fillet fish, and cut meat. Each part of the knife is designed to perform a different task. It is the flagship of cutlery. The Messermeister Royale Elite 3.1/2" Paring Knife, with the blade that tapers to a point, is our most popular style paring knife. This size blade is ideal for paring, peeling, scraping, slicing and trimming small fruits and vegetables. It is also perfect for chopping garlic and ginger. The Paring Knife is considered to be the 2nd most often used knife in the kitchen and many home chefs have 3-4 in the drawer. There are many grips depending on the task and they usually involve holding the item by hand when making the cut. 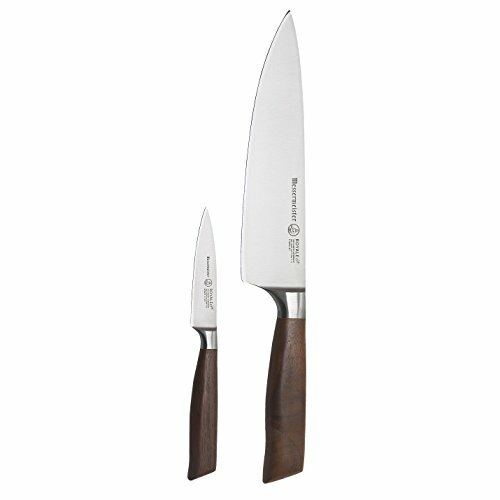 The Messermeister Royale Elite 2 piece set consists of an 8" Stealth Chef's Knife (E/9686-8S) and 3.1/2" Paring Knife (E/9691-3.1/2). These are the two essential knives of the kitchen!